This is the same treble by-pass filter circuit Fender® is installing in their 2017 American Professional SSS Strat. This filter kit is also referred to as a "treble bleed circuit". The treble by-pass filter helps maintain the high end treble response in your tone when you turn down the volume control. Typically you will roll down your volume on the guitar to reduce gain and with this filter installed your tone will retain its treble no matter where the volume is set. No longer does your tone have to get muddy when you roll down the volume. For our kit's components we have selected Vishay ceramic disc capacitors and Xicon resistors. 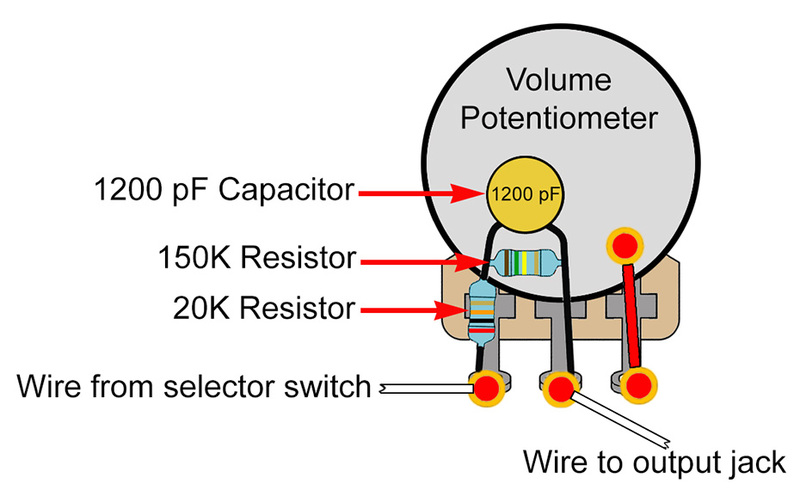 This kit requires you to solder this treble by-pass filter to the center and outside lug of your guitar's volume potentiometer, see illustration below for details. 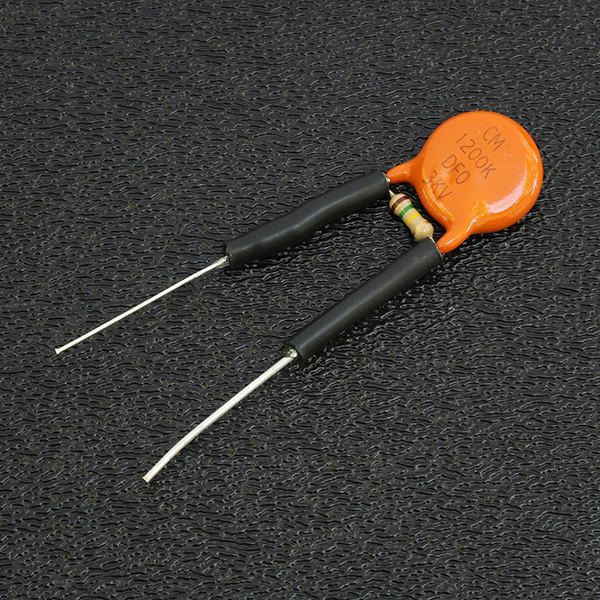 Due to the small size of the components in this kit, it is recommended to use heat sink alligator clips to help dissipate heat from the soldering iron to prevent damage to the components. We shrink tubing insulate the two hookup leads insulating the 20K resistor on the one lead and equally shrink tubing insulate down the other lead to the point where both leads get connected to the volume potentiometer, this will prevent unwanted contact with other components creating a short circuit. All 3 components in this filter kit are pre-soldered together and the connection leads are partially shrink tubing insulated. If you do not wish for us to pre-assemble this filter kit simply ask us for the bare components, pricing is the same. NOTE: Installation instructions are not included additionally with this kit. All instructions are provided on this item page, see illustration / instructions to the right for how to orientate / install this filter kit correctly. Install the treble by-pass filter as shown above. On the two leads from the capacitor you will notice one is thinner, this is the side with the 20K resistor and will connect to the side of the volume potentiometer that has the wire from the selector switch.